Inside The Facebook Hackathon: What's Next? Hacking sometimes has a bad connotation. It certainly didn't Thursday at Facebook's latest hackathon. The Menlo Park social networking giant, with the help of the Bill & Melinda Gates Foundation, provided a venue for an array of people to hack away at a big problem: Helping high school students - especially low income ones - get into college. The hackathon was dubbed, the "College Knowledge Challenge," and runs through Nov. 16. On Thursday morning, several dozen people sat on couches and scribbled with markers on easels, and of course, tapped away on keyboards, hoping to come up with a way to simplify the college application process. They were working on developing apps, websites and other online tools as part of the college-bound contest. "I think the power behind social media is providing social proof," said Mandela Schmacher-Hodge, a developer working at Facebook headquarters. "We're creating an app to reach out to young people, rebranding college as cool as possible." Developers such as Schmacher-Hodge are not being paid for their time, but do have the chance to win up to 30 grants between $50,000 and $100,000 in Gates Foundation prize money. The winners of the $2.5 million grant competition will be announced in January. 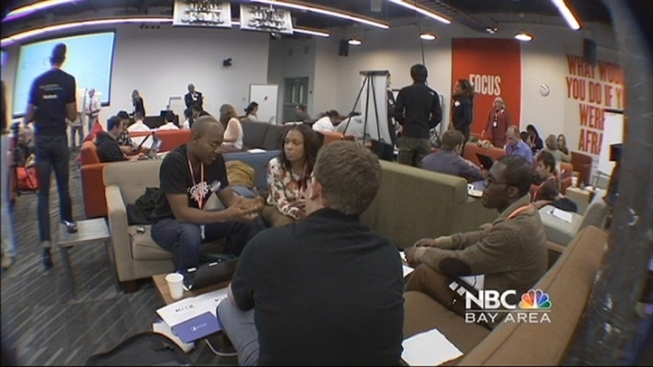 We want "to use social (media) to convince kids to talk to each other about the best schools, scholarships and ways to apply," Facebook's David Steer told NBC Bay Area inside a rare view of such a hackathon. "We're mixing education professionals, techies, you name it," said Deborah Robinson of the Gates Foundation added. "We just want to make the process easier." On the College for Knowledge website, the Gates foundation said that the winning apps will address challenges students face: Navigating college admissions, untangling the confusion of financial aid and figuring out the best path to graduate. Students from College Summit Northern California partner high schools and college students will advise the developers during the competition. If you're not familiar with a hackathon, it's basically a way to get a whole bunch of creative people together in a room, and let them spend the entire day thinking and coding their way to a better solution. Some hackathons, also called "codefests," are simply for educational or social purposes. But the goal is usually to create usable software. Developers interested can learn more here.